Yesterday was day 1 of a new month in the lunisolar calendar (Chor Yat/初一) so my friend suggested that we have a vegetarian lunch and she brought me to The Good Co which is well known for serving healthy meatless food. Their tagline is "Nothing Beats Honest Food". She ordered Vegan Chicken Rice - MYR20.90 nett and ate up every food item including the homemade chili sauce which she said was delicious. 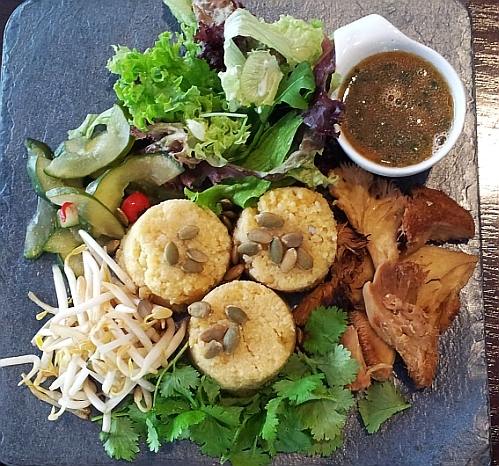 The monkey head mushrooms are the "chicken" and millet is the "rice". 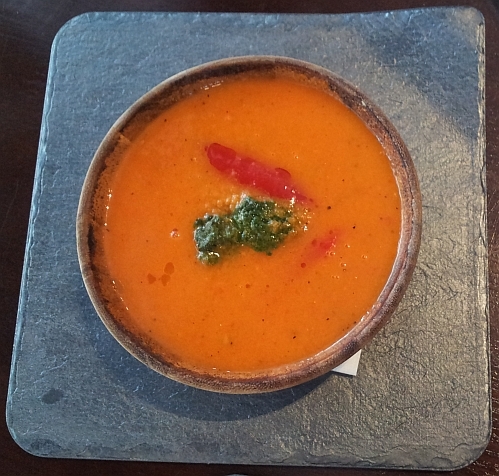 She also had the Tomato Bell Pepper Soup at MYR14.90 nett which she drank till the very last drop and said that it was very tasty. 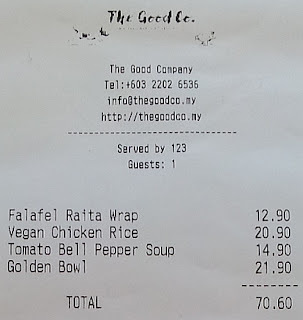 My food - Golden Bowl at MYR21.90 nett. 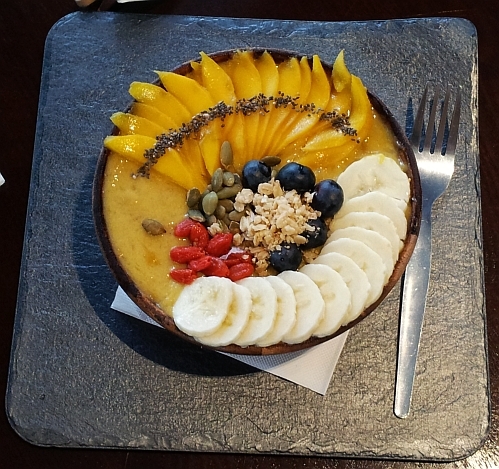 This is a bowl of smoothie with mangoes, bananas, wolfberry, blueberries, chia seeds, pumpkin seeds and granolas as toppings. The main taste of the smoothie is banana. The smoothie is cold, not too sweet, is tasty but a bit too much for me though I finished it all because it is easy to eat since it is like eating cold dessert. Would be perfect if I share it with another person. I also ordered the Falafel Raita Wrap at MYR12.90 nett but ate only one segment and took the 3 remaining segments back for dinner because I was full from finishing the smoothie. This wrap is made up of homemade falafel, cider pickled carrot, coriander, lettuce, kyuri and mint raita sauce. The wrap is very crispy. My friend said we will eat here again so I am studying the online menu to see what I would order on our next visit. 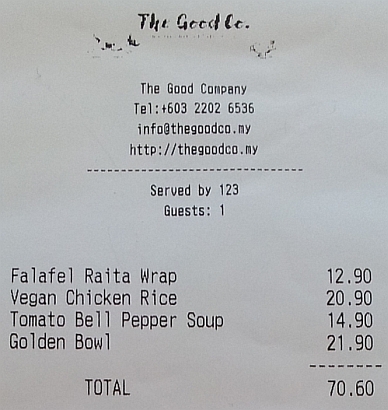 Total Bill for 2 pax is MYR70.60 nett. Comfortable dining area with a high ceiling. We placed and paid for our order at the counter before taking our seats. 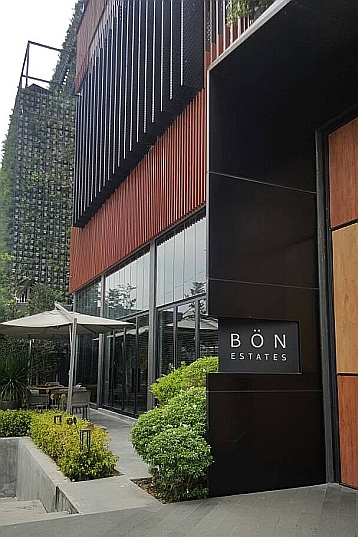 Just enter through the glass doors. 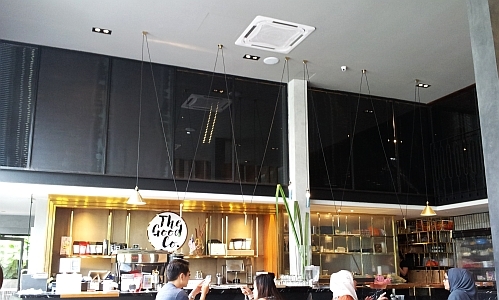 The Good Co. eatery is located in this BON Estates building which is opposite Bangsar Shopping Center on Jalan Maarof, Bangsar. There is a limited foc parking space (about 6 to 10 cars) for customers of The Good Co. eatery at the side of this building. It is good to eat vegetarian food on Chor Yat. I would order the chicken rice and tomato bell pepper soup too as they look tasty. I can take the homemade chili sauce if it is not too spicy. I will go hungry within an hour if I just eat the smoothie. Hee hee. Can I say that the food they served is fusion food? don't think is fusion food, just meatless food. the vegan chicken rice is new and the online menu has not been updated yet but the online order system has been updated so you can see the new food items in the online order system. Oh my! It sure looks good, the chicken rice. Thumbs up for their presentations. the other 3 smoothie bowls are even more pretty. Very creative food. The chicken rice looked good. Nice presentation and the plate of chicken rice looks good! Your golden bowl looks very nice. do you like to eat smoothie? Yes. Not a as a meal though! you can have it as desserts after your main meal. All looks very healthy to me.. I like! I think your daughter would like the smoothie bowl. Wah! I like your smoothie bowl. I bet I would enjoy it a lot. I think you would too but you could make your own since you are so diligent and skillful in cooking and baking. I like that Golden Bowl and it is so healthy. I can easily dig in and slowly habis all. Sluurrpppss!! i think you can quickly finish all.